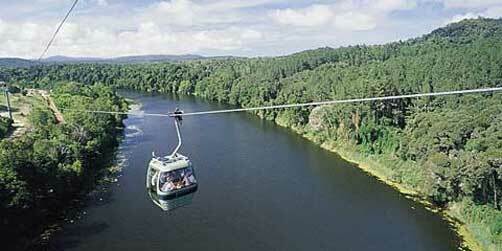 An amazing place to visit after your hot air balloon ride is Kuranda Village. Kuranda is located in Tropical North Queensland, just 25km northwest of Cairns and is surrounded by World Heritage Rainforest. Kuranda is famously known as the Village in the Rainforest and is a beautiful day out and way to expereince the Rainforest, some shopping and great food. You may wish to take our self-drive option to the Atherton Tabelalnds for your balloon ride and then a scenic drive back afterwards for a morning in Kuranda. Or you may wish to pick one of our easy tour options that includes transfers from Cairns, Palm Cove or Port Douglas accommodation. We have tour options that include the Kuranda Historic Rail Train, Skyrail Rainforest Cableway and free time in Kuranda Village. Kuranda is bursting with shops, restaurants, cafes and markets as well as nature attractions such as Australia Venom Zoo, Bat Reach, Butterfly Sanctuary, Birdworld and Kyuranda Koala Gardens . Learn more about aboriginal culture and history and perhaps purchase an aboriginal artefact or maybe some other handcrafted goods. It’s a great place to relax and unwind on your Queensland holiday. The Kuranda Information Centre right in the heart of Kuranda Village is a great way to start your orienation and visit so why not drop by and say Gday to the freindly staff there.